We organise regular seminars and youth congresses. 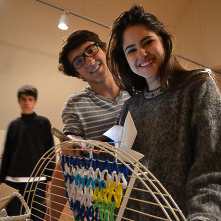 Young people from all over the world come together in our house to develop and create artistic projects. In doing so, they experience the arts as a means of mutual enrichment and transcultural communication. Through the shared analysis of sociopolitical themes, participants profit from unaccustomed viewpoints, thus expanding their own horizons.